The leader of Northamptonshire County Council Matt Golby has said that he and other cabinet members will not resign. Calls have been made by opposition councillors today (July 24) for the Conservative leader and some of his longer-serving colleagues to quit their posts after a Section 114 notice was issued today (July 24) by outgoing chief finance officer Mark McLaughlin. This is the second time in 12 months a Section 114 notice has been issued at the council, which is now being overseen by two Government-appointed commissioners. Speaking today Cllr Golby, who has been a member of the cabinet since 2014, said he was disappointed that opposition politicians had called for him to step down. He said: “That is not going to happen. We are a new cabinet and are all about taking responsibility for what we find ourselves in. We are committed and focused on getting on with the job. Mr McLaughlin and lead commissioner Tony McArdle have today made public that £60m to £70m worth of savings are needed this year to stop the authority from going under. There will be no extra money from central government so the already severely reduced services will need to be cut further and more jobs could be lost. In a report issued to councillors this morning Mark McLaughlin said that financial decision-making had been ‘factually wrong, ill-informed, out of step and inappropriate’ over the past four financial years. 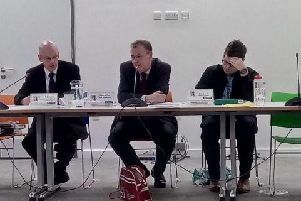 Opposition councillors Cllr Mick Scrimshaw (Labour) and Liberal Democrat leader Cllr Chris Stanbra said Cllr Golby along with Cllr Michael Clarke and Cllr Ian Morris should consider their positions following the new financial revelations. All of Northamptonshire’s council’s are set to be scrapped from May 2020 after central government has dictated that a unitary system is introduced. Asked whether he would stand in those election Cllr Golby said: “I’ll see where we are’.